Wall caps which are often referred to as wall vents can be one of the most convenient and attractive ways to hide certain holes in your exterior walls. All homes have holes for things like exhaust fans or dryers. Unfortunately, these holes can be unsightly, and they can even allow bugs or water to enter your home. To help hide these holes, FAMCO has created a extensive line of wall caps. Our wall caps are made from a diverse number of materials like aluminium, copper and plastic. The material that most consumers pick depends upon their personal preferences about how they want their wall cap to look. The copper cap is especially attractive as it is a naturally polished copper that turns into a blue-ish green patina as it ages. Once a consumer has decided on the material that they like for their wall cap, they get to look forward to enjoying its function. Most caps are attached to the ends of pipes that are attached to exhaust fans or dryers inside the house. In most cases, the wall cap will be fitted with a closure. 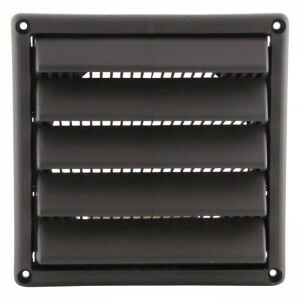 When the fan or dryer is not in use, the flap stays closed. This flap prevents insects and rodents from entering the home, and it also prevents icy drafts from getting inside. When the dryer or fan is in use, its air forces the flap open, and once it is open, air is allowed to pass outside through the wall cap. The shape of the wall cap is also instrumental in its function. The unique shape of a wall cap stops falling rain or water from the sprinkler from getting into the house. Its shape also stops leaves or other blowing debris from entering the pipe and blocking it when the flap is open. It is practically impossible to avoid having these types of holes in your home’s exterior walls. Without exhaust fans in kitchens or bathrooms, moisture or smoke can build up and damage those areas. Dryer vents are a necessity because as the water leaves the wet clothes, it needs somewhere to go. FAMCO understands the importance of a wall cap to homeowners, but they also understand the importance of having a beautiful home. That is why they have a wide range of wall caps to suit the needs of almost every homeowner. When you need to cover the holes in your exterior walls, FAMCO has exactly what you need.